I've taken pictures this time around from IMM seeing as the poll I made had the most votes for this! Awesome mailbox !! Nightshade, Unearthly and 13 Little Blue Envelopes are awesome !! I hope you'll like them and I look forward to read all your reviews !! for! And I love Simone Elkeles. Happy reading! You got awesome books this week! I hope you enjoy all of those. 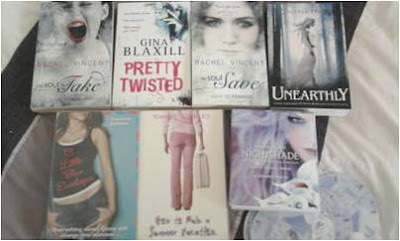 I have yet to read Unearthly, Nightshade and My Soul to Take! Unearthly sounds fantastic, hope you like it! Wow! Great books! I still haven't read Unearthly, but I'm hoping to get to it soon! Rachel Vincent is awesome. I hope you enjoy all your reads this week! Hey, new follower stopping by. The Rachel Vincent series is great!! Awesome books this week! I recently finished 13LBE and am reading The Last Little Blue Envelope. I am a sucker for a novel that takes place across Europe. Unearthly is flipping awesome!!! Great books! Oh such awesome books!! I LOVE Nightshade and Unearthly! <3 I've been seeing Pretty Twisted around lately and it's been intriguing me, curious to see what you think of it!